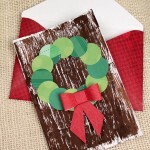 In this fun craft, your kiddos can make a personalized Christmas apron for the holidays. This is a fun activity for young children as well as the older ones. Kids could also make a special apron for a grandparent by stamping their handprints instead of using stencils. Cut pages 2 and 3 in half to separate the stencils. Cut out the center of each stencil. Note: Fold each stencil in half (along dotted line) and cut out the shape. Unfold paper. Now you have 5 stencils! Place stencil on apron and use brush to apply paint. For best results, dab the paint onto the fabric in an up & down motion. Optional: Write name at the top of the apron with a marker. Now you have an apron to wear while baking Christmas cookies for Santa. Hey, parents! Want to make a pretty apron for yourself? Click the image below to get directions on how to make a Reversible Christmas Apron.